Desks first appear in the late 17th century (the 1600's) as bureaus, i.e. a sloping front desk in which the writing surface can be opened and closed. They were an adaptation of the chest of drawers onto which the writing slope was fitted. The bureau has subsequently become a very popular form of the desk for a sitting-room and was made in great numbers during the 18th century. These bureau desks were closely followed in Queen Anne (1702 – 1714) period by the kneehole-writing table. This was a small desk with drawers either side of a kneehole, which was often fitted with a central cupboard. These were either veneered in walnut or provincially constructed of oak. 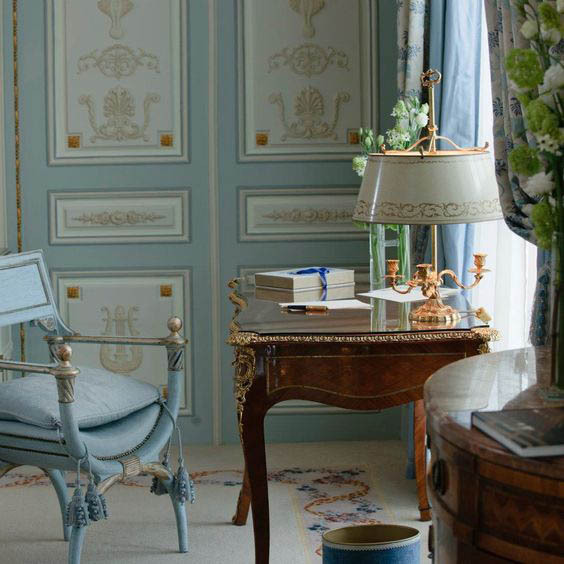 It is not until the 1750’s that we start to see the pedestal and partners desk that has become so popular today. At this time the Caribbean islands made available mahogany, a wood which is richly figured and when polished and become a deep reddish brown colour. This wood was a luxury item and popularised by designers, such as Thomas Chippendale, who was working for wealthy patrons. 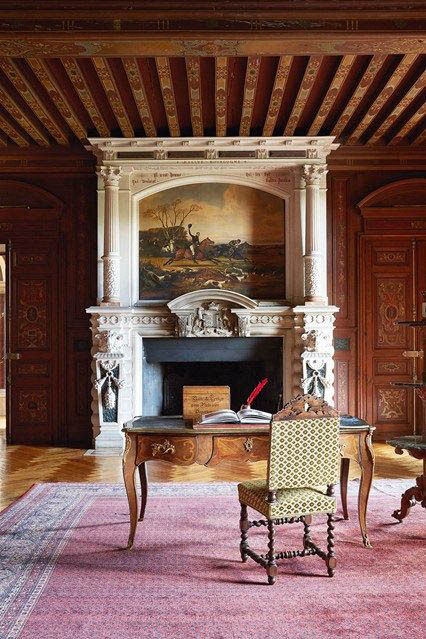 Consequently, most desks, which survive from the mid-18th century, were made for the country house library. They are often large, ornate, with carved embellishments, and command substantial prices due to their rarity. At the start of the Industrial Revolution, in the later part of the 18th and early 19th century, we saw the rise of a new entrepreneurial class or business class, growing wealthy from the industries they spawned. These business people followed the fashions of the day and had a practical use for desks of all sizes within the workplace and at home. From small kneehole ladies desks to large partners desks and library tables, the proliferation of office based work created an opportunity for furniture makes to produce many and varied desks for the home and business of the new wealthy class of entrepreneurs. In the late 18th century English writing tables were fairly simple practical pieces of furniture of rectangular form on square tapering legs with brass castors. 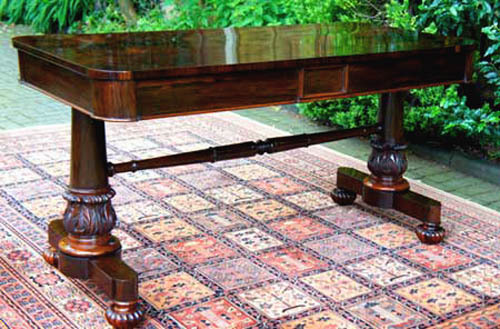 Most tables would be fitted with two or three drawers to one side only and the writing surface would be polished wood. They were designed for domestic use in the more affluent household that could afford furniture specifically for writing. As writing tables became more popular with the growing middle classes in England, we start to see the introduction of the leather writing surface, which is a much more practical surface for a desk. 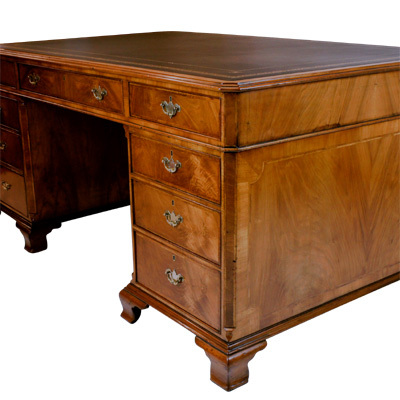 The growth of industrialisation and the proliferation of offices and administration roles in businesses lead to the development of the partners writing table where two people could share a desk or writing table with drawers to both sides. This was a much more sturdy type of writing table often made from mahogany with black leather writing surfaces decorated with gilt and or blind tooling. These are still very sought after today as they offer a very good working surface and four or six useful drawers. These large partners library tables or writing tables are also useful in homes as well as offices for their capacious surface, style and presence. Once we enter the 19th century and particularly in the Regency period we start to see all sorts of variations. The most obvious being the type with end standards or supports at the ends rather than having four legs. Writing tables then fall into two well-defined categories; those for domestic use and those for commercial use. Those for domestic use are often more ornate using inlays of exotic woods and sometimes with brass or gilding. They were made in smaller sizes usually no larger than 54 inches. plainer as more businesses wanted work tables at a more affordable level for their employees. was now being undertaken by machinery. and Arts and Crafts movement began to have an influence on the fashions of the day. wholesome hand-made Arts and Crafts designs trail blazed by William Morris. Consequently we see a huge variety of types of writing tables to suit all situations, tastes and budgets. occasional tables as well as desks. 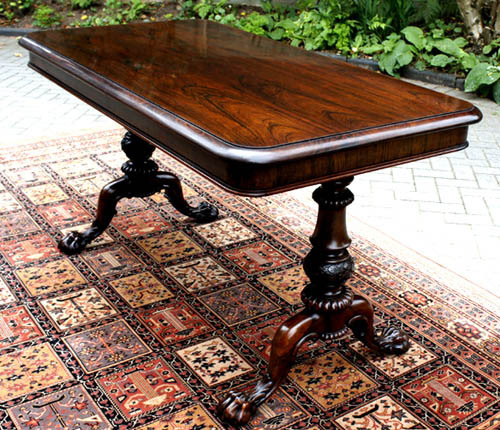 antique desks and writing tables that are available in the market today. They were made in a variety of styles and sizes throughout the 19th century. and to show equality of status. sections, two pedestals and a top, with castors hidden beneath the plinth. This makes them easy to move and gives access to awkward places. During the period 1830 - 1870 they often had rounded edges and moulding's to the drawer fronts. The handles were generally turned wooden knob pulls. top were at right angles and drawer fronts were mainly plain. During this period, 1870 - 1910, desks were produced in large numbers and of varying quality. Brass and pressed metal handles were more often used than turned wooden knobs. 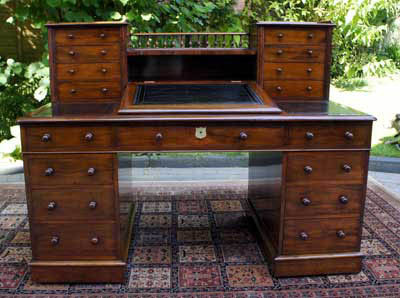 The roll top or Wells Fargo desk became popular, particularly in the work place.